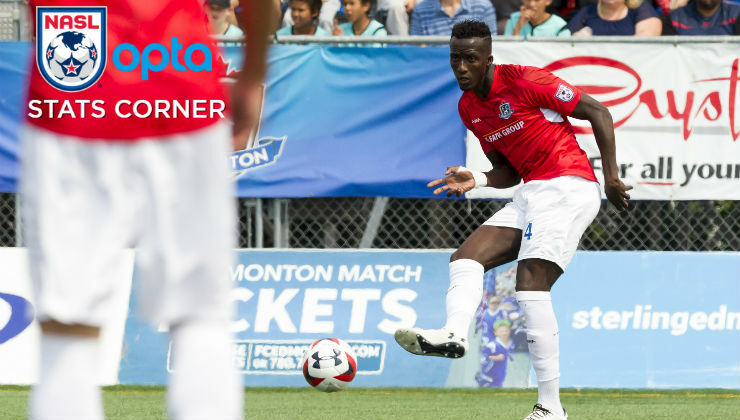 FC Edmonton defeated Indy Eleven, 3-1, in Week 2 of the Fall Season and defender Abdoulaye Diakité and midfielder Ben Fisk had big parts to play in the road victory. Both players have been in good form as the Eddies look to make a ush to return to the postseason. Diakité finished with 16 clearances in the recent victory for FC Edmonton, which helped the 2016 NASL Young Player of the Year earn Player of the Week honors. Clearing the lines has become a regular occurrence for the central defender who has more clearances than any other player since the start of the 2016 season. Diakité has made 221 of them and teammate Albert Watson is second in that category with 181. Diakité made 17 clearances in a game, coincidentally at Carroll Stadium against Indy, earlier this year, which is the most in a game since 2016. The Senegal native has been more important to the Eddies’ back line than just for his clearances. He’s made 32 interceptions as well and has the second most since the start of last year – his first in the NASL – with 118. Fisk has become the club’s most dynamic creative force over the last four games. During that period he has picked up three assists and is now tied for the most chances created in the league with 32. Over the past four games, the Canadian international has created at least four scoring chances, racking up five in the victory over Indy Eleven. Indy Eleven’s Nemanja Vukovic and Steven Miller have been two of the best attacking fullbacks in the NASL. Vukovic scored on a fantastic free kick last weekend, which came in the loss to FC Edmonton. Over the course of the year, he’s scored two goals to go along with three assists and has created the most chances for a defender with 27. North Carolina FC’s Steven Miller made a big impact in the club’s recent win, earning two assists, which brought his total to three on the season as well. Miller has also provided one goal on the season and has created 11 chances overall.